This year is off to a great start! Thank you for your partnership and commitment to what God is doing here on his campuses and for being such an encouragement to me! Thanks to your support we hit the ground running at Richland College and have been meeting new students every day that we are there! I think leading the ministry at Richland has been one of my most fulfilling experiences up to date. God has been teaching me a ton about thinking pastorally, setting the tone, and keeping an optimistic mind regarding what God has planned. My intern, Nicki, is also doing a great job (she's in the last photo towards the bottom of our staff). She has befriended several of the girls in the ministry and has been a solid rock for me to bounce ideas off of and share the experience of ministry with (see pictures below of our Richland FOCUS ministry). (From left to right) Hazel, Cameron, Wyatt, myself, and Chad all helped out with our Richland FOCUS info table. We had over 100 students sign up and show interest in being a part of our group. One of our first Richland FOCUS meetings. Karlo (one of our student leaders) led us in worship and we had a great discussion on vision. We've been encouraging our students to develop a vision for their campus and the people around them. We had a Pizza & a Movie day for one of our large group meetings and a lot of students showed up! It was a great success and we met new people. Please be praying as we try and discern what would help serve our campus in addition to building new friendships. Our first worship session at FOCUS Fall Camp! This was our largest fall camp to date! Shot from the sound booth at UTD FOCUS at one of our Friday Night services. We have been going through 1st Corinthians and our students are really enjoying the content! Side-shot from our Friday Night FOCUS service. 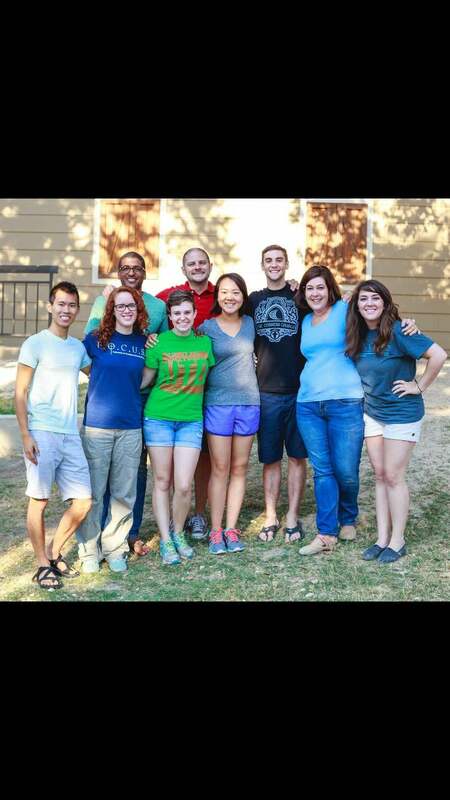 A picture of our UTD/Richland Staff! Back row: Myself, Brandon, and Laurence. Front row: Peter, Nicki (my intern), Carmen, Danni, Mandy, and Victoria. It's been such a blessing to work with these ministers this year! Thank you all so much for your commitment to our mission to reach students on campus for our Lord, Jesus. As the months go by I am continually grateful for people like you who have decided to join in with us in the work of the gospel and walk alongside us. The year is just getting started and we know that the best is yet to come! Please be praying for our Richland ministry - pray that God would stir a need for him and his Son on campus and that we, as God's people, would be faithful with every situation he puts us in on campus and elsewhere. The mission is far from over and there are many more students to reach! I love you all dearly, and you'll be hearing from me soon!